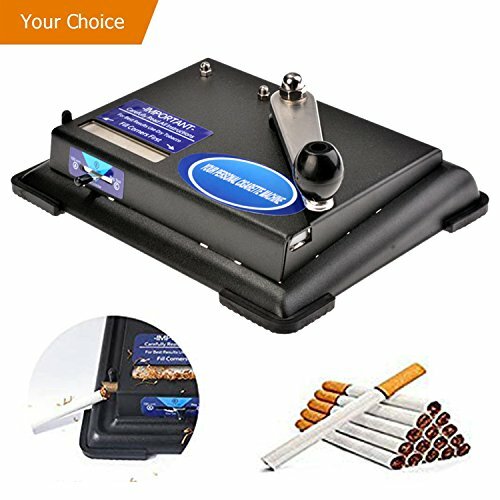 Hurbo Cigarette Rolling Machine Hand Operation Cigarette Making Tobacco Injector Maker Roller Machine (Black) by Hurbo at Serious Jones. Hurry! Limited time offer. Offer valid only while supplies last. How to use: 1. Place lever to start position. Fill tobacco chamber evenly, starting at each end and filling onto the center. Do not pack too tight. 1. Place lever to start position. Fill tobacco chamber evenly, starting at each end and filling onto the center. Do not pack too tight. 2. Slide cigarette tube onto nozzle. Move selector switch to desired cigarette size: Position A for 100mm; Position B for King Size; Position C for Regular Size. Material: Iron with spray coating; sturdy, durable and long Lasting. If you have any questions about this product by Hurbo, contact us by completing and submitting the form below. If you are looking for a specif part number, please include it with your message.